Alex and Bambi, and the towering waffle dinner! Wow - that looks amazing! and delicious! Did they manage to eat it all? There were five young people in the house that night... waffles are gone, gone, gone! 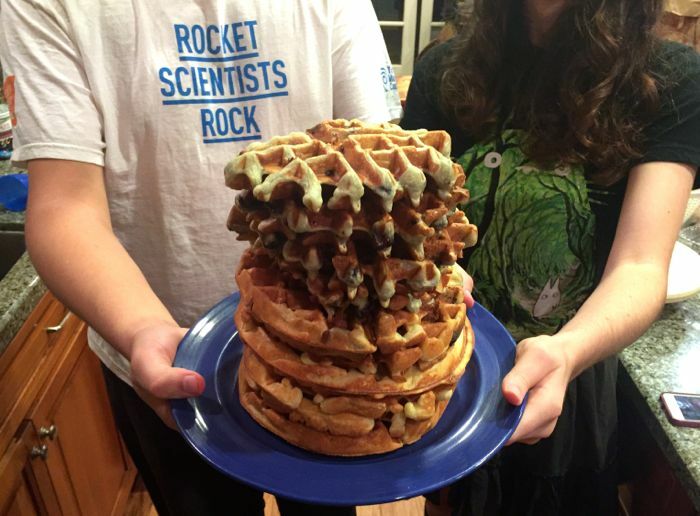 Blueberry waffles on the top... a thing of beauty, indeed! One Miyazaki shirt... awesome! One science rocks shirt... awesome! Homemade maple syrup! That would be totally amazing. I saw the post with your husband's cottage industry set up, and I think it's really cool. Having read Little House In The Big Woods to all four of my children, I have long held a special admiration, and fascination, for making maple syrup.